In this exciting instalment, Delilah Dusticle and the Dustbusters travel to the vibrant and mystical land of India. On arrival, they are tasked with a quest to overcome a powerful curse and save a life. It soon becomes clear that it is Delilah, who must find the strength and the power to defeat the curse. This is the third in a series of stories following Delilah and the Dustbusters on adventures around the world. Get ready to join the fun and experience the magic! "Quick, lively and entertaining reading specifically written for children ages 8 to 12, A. J. York's fantasy trilogy is very highly recommended for family, middle school and community library collections." Haven't read the first two stories yet? Check out the story bundle under the name The Delilah Dusticle Adventures. It has been a while since I read the previous books in the series, so it took me a bit to remember all of the characters. While I do recommend reading this series in order, you would probably catch on to the characters and concept fairly quickly. However, the previous books are just as clever and just as much fun as this one was, so I suggest that you read those as well. This series is very lighthearted, and the books are engaging, easy to read in one sitting. Sometimes, a novel can be really heavy, and full of chaos and plot twists, and that can be good on occasion. However, sometimes there is that light easy read that is just so much fun that it makes you smile. That is how I think of the Delilah Dusticle books. Sometimes the characters act a bit silly, and it just makes the story that much better. I enjoyed the plot of this installment in the series. I found that I was engaged and interested in what happened. I also found myself unable to predict the ending. Because I wasn't expecting it, I was very pleased with the way that it turned out. The characters were even more lovable than I remember them being. Sometimes they act a little silly, and once you realize that they have this tendency you will find yourself smiling at their behavior. I also love how the author connects her various books and series. In this particular novel, there is a reference to her other book, Eliza Bluebell. I feel like later in the series these books may be connected, and I am definitely interested to see how it is done. The last chapter of this book ended on something similar to a cliff hangar that set the stage for the next book in the series. As I read that last chapter I found myself eager to get my hands on Book 4. The author's writing style is pleasant, and I found that her words were easy to read. The plot was engaging, and its events flowed together nicely. The concept for this series is unique (The main character has the power to eradicate dust! ), and each book is as fresh and exciting as the last. I believe that this series would be a hit with not just children and middle grade readers, but also with adults who enjoy reading a story that makes them smile. This most recent installment in the Delilah Dusticle series was creative, the characters enjoyable, and the solution to the problem pleasantly unpredictable. 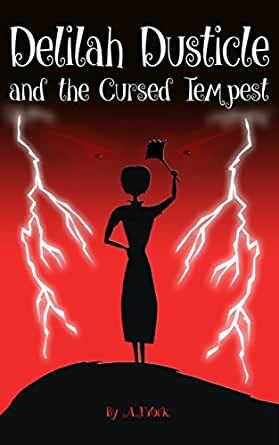 Delilah Dusticle and the Cursed Tempest is a modern-day fairytale featuring a dust fairy and her cleaning company. This time, she’s called on to save a town from a terrible curse, but though her dust fighting powers are perfect for the job, she knows she can’t use them in the way everyone expects. I really enjoyed this story. The writing is tight and to the point, while still bringing to mind the vivid imagery that breathes life into a story. There’s a good bit of magic, as would be expected in a fairy tale, but in a modern setting. The characters are also pretty cool and varied in their personalities and quirks: the leather jacket guy (there’s a funny picture of him in the book), the lady who’s always searching for nearby enemies and threats, and even the grumpy sponge, whose grumpiness is offset by a new bout of orneriness I found delightful. The illustrations are a bit more abstract than in earlier books, but artistically pleasing and complementary to the story. Near the end (starting chapter 10) the cute little spider is back (the one from the Transylvanian adventure). I’d have loved to see more pics of grumpy sponge because he’s another of my favorites, but what’s there is good. The only thing that threw me off is that it’s been a bit too long since I’d read the previous book. As a short read, this story doesn’t spend much, if any, time reorienting readers to the things leading up to this point. For a little while, I thought I might have missed one of the books as what was mentioned seemed unfamiliar. I later figured out that some was referencing events from the previous story, some was previously unrevealed backstory, and the rest was filling in the time between the last story and this one. On that note, I’d recommend reading (or rereading) the previous two stories, plus Eliza Bluebell, before starting this one. Overall, I thought this was a fun read, both humorous and serious at times with a clever cast of characters and an interesting setting. I’d recommend it to folks who like shorter reads, fairy tales, and funny stories. The illustrations are nice, too, though not quite as standalone entertaining as they were in the last book. I received the review copy of this book from the author.